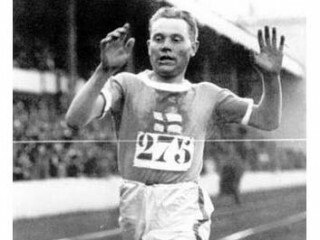 Paavo Nurmi (also known as: Paavo Johannes Nurmi) born July 13, 1897 in Turku, Finland - died October 2, 1973 in Helsinki, Finland is a Finnish track and field athlete. He was known as one of the "Flying Finns"; a term given to him, Hannes Kolehmainen, Ville Ritola and others for their distinction in running. During the 1920s, Nurmi was the best middle and long distance runner in the world, setting world records at distances between 1500 m and 20 km. Nurmi won a total of nine gold and three silver medals in the 12 events in which he competed at the Olympic Games from 1920 to 1928. In 1932, Nurmi was unable to compete at the Olympics, as he had received money for his running and was thus considered a professional. Paavo Nurmi was one of the greatest distance runners of all time. Known as "The Flying Finn" and "The King of Runners," he dominated long-distance running throughout the early part of the twentieth century, setting 25 world records at distances from 1,500 meters to 20,000 meters and winning nine gold and three silver medals at three Olympic Games from 1920 through 1928. Born on July 13, 1897 in Turku, a port town on the southwest coast of Finland, Nurmi was the son of a carpenter and began running through the Finnish forests when he was nine. He later claimed that he grew up eating black bread and dried fish. If he did, this meager diet made him a champion. His father died in 1910 and Nurmi finished his schooling with an average of 9.38 out of a possible 10. He worked on docks and was a filer in an engineering shop for the next four years. Nurmi was inspired to become a runner by the incredible performance of Finnish runner, Hannes Kolehmainen, at the 1912 Stockholm Olympics. Kolehmainen brought his small country to international attention by winning three gold medals in long-distance events. Nurmi was 15 years old at the time. He soon bought his first real pair of running shoes and started training. Nurmi was one of the first athletes ever to take a systematic approach to training. Although this approach is common today, in Nurmi's time no one had yet thought to train with a stopwatch to measure pace and time, or to cross-train by combining running, walking, and calisthenics. His major innovation in training was to run most of the race at an even pace. Because he ran with a watch, Nurmi, unlike other athletes, knew what his pace was while he was running and could plan his winning strategy. Before this, runners had run fairly slow laps around the track, conserving their strength until the last lap when they sprinted to the finish. The Sports Museum Foundation of Finland quoted him as saying, "When you race against time, you don't have to sprint. Others can't hold the pace if it is steady and slow to the finish." Nurmi's discipline took precedence over everything else in his life. "Success in sport as in almost anything comes from devotion," he said, according to Joe Brady in Virtual Finland, "The athlete must make a devotion of his specialty." Nurmi certainly did that, critically analyzing his daily training schedule, combining long, slow runs and long walks. Obsessed with running, he seemed to observers not to have any personality at all. Nurmi appeared to be a remote, cold, and inhuman running machine. He did not socialize with other athletes, never gave interviews, disliked publicity, and seemed never to let anyone get to know him, throughout a long career. As Brady noted, "Nurmi was an introvert. To many observers he seemed bleak and remote, interested only in his running." Nurmi's inward intensity was a part of his personality, but also came from the fact that he was determined to leave records that would never be broken. According to the Sports Museum Foundation of Finland, Finnish journalist Martti Jukola wrote of him in 1935: "There was something inhumanly stern and cruel about him but he conquered the world by pure means: with a will that had supernatural power." In 1914, Nurmi joined Turun Urheiluliitto, a Turku sports club that he represented throughout his career. On May 29 his training paid off--running at Turku, he set his first national record by running 3000 meters in 8 minutes, 36.2 seconds. There were no Olympic Games in 1916 because of World War I, but in 1920 Nurmi ran at the Olympic Games in Antwerp, Belgium. In the 5,000 meters, his first race, he lost to Joseph Guillemot of France. This would be the only defeat to a foreigner in an Olympic final during his entire career. He won gold medals in the 10,000 meters and the individual and team cross-country events, and a silver in the 5,000 meters. After the Antwerp Olympics, Nurmi continued to win. He set his first world record on June 22, 1921, in Stockholm by running the 10,000 meters in 30 minutes, 40.2 seconds. After that, he set a new world record in distances ranging from 1,500 meters to 10,000 meters, racing with his stopwatch in hand, adhering to a rigid schedule he had planned beforehand. Instead of concerning himself with what his competitors were doing, Nurmi was more concerned with meeting his own high goals, set by his watch. By the end of 1923, Nurmi held world records in the mile, the 5,000 meter, and the 10,000 meter races, a feat that has never been done before or since. At the 1924 Paris Olympics, the Flying Finn won five gold medals in six days. Nurmi won the 1,500 and the 5,000 meters within an hour of each other, won the cross-country race as an individual and as part of a team and won the 3,000-meter team race. In the 1,500-meter event, he ran 800 meters in 14:31:2, killing all opposition by effectively winning long before the race was over. He was so confident that he tossed his stopwatch onto the grass and cruised easily to the finish. In the 5,000 meters, he tried a different tactic. His rivals, Ville Ritola of Finland and Edvin Wide of Sweden, started with a fast pace. Nurmi ran steadily 40 meters behind them, waited for them to fade (meanwhile checking the pace with his watch), and then passed them. In the cross-country race, he stunned everyone with his seemingly superhuman performance--on a day so hot and humid that 24 of the 39 entrants collapsed along the way, Nurmi seemed untouched and won the race by two minutes. In that same Olympiad, Finnish authorities barred Nurmi from competing in the 10,000 meters because they wanted to give Finnish runner Ville Ritola a chance to win a gold. This angered Nurmi, so he went to another track and ran alone, recording his time on his stopwatch. It was faster than the official time set by the gold medal winner. In 1925, Nurmi embarked on a tour of the United States, running mostly on indoor tracks. In five months, he raced 55 times, won 53 of the races, lost once, and opted out of the race once. Perhaps this tour tired him because Nurmi lost some of his edge. He began winning by shorter margins and he never bettered the three world records he had set in 1924 in the 1,500, 5,000, and 10,000-meter events. Despite the decline, Nurmi went to the 1928 Olympic Games in Amsterdam. If he performed well, it would open the door for him to enter the potentially lucrative American track circuit. He won a gold medal in the 10,000 meters and took silver in the 5,000 meters and the 3,000 meters. According to the Sports Museum Foundation of Finland, when he was 31, Nurmi told a Swedish newspaper reporter, "This is absolutely my last season on the track. I am beginning to get old. I have raced for fifteen years and have had enough of it." Nevertheless, he continued to run and, in 1929, went on his second American tour. By 1930, he had regained some of his old energy and form and set world records in six miles and in 20 kilometers. In 1932, Nurmi headed for the Olympic Games in Los Angeles, determined to defend his 10,000 meter record against rivals. He also hoped to win a gold medal in the marathon, just as his hero Hannes Kolehmainen had done in 1920. The IAAF barred him from Olympic competition because, they claimed, he was no longer an amateur: he had been paid travel expenses for a tour through Germany in 1925. At that time, athletes could only compete in the Olympics if they had not made money from their sport, so Nurmi was out. Nurmi went to Los Angeles anyway, stayed in the Olympic village and kept training. Runners who saw him reported that he suffered from a foot injury and was barely able to walk. However, his determination was so great that Nurmi ran anyway. Other runners scheduled to compete in the marathon pleaded with IAAF officials to let Nurmi run, but their pleas were ignored. Barred from running, Nurmi could not bring himself to watch the 10,000 meters or the marathon. He later claimed that, if allowed to compete, he would have won the marathon by five minutes. Because he had competed as a professional runner, Nurmi was no longer allowed to compete in international amateur events. In Konigsberg, Germany, on October 4, 1931, he won his last event outside Finland, a 5,000-meter race. He continued to run in Finland after that, and was known as the "national amateur." He ran his last race in Viipuri, Finland, on September 16, 1934, winning the 10,000 meters. After retiring from running, Nurmi became a businessman and building contractor. He had saved and invested his money since the 1920s and now made a great deal more, mostly through house building; 40 townhouses that his company built are still standing in Helsinki today. In addition to business, Nurmi sometimes trained other Finnish runners. He hated publicity, but when World War II began and Finland was threatened by the Soviet Union, he went to the United States to gain support for the Finnish cause. In 1952, the Olympic Games were held in Helsinki. As was the tradition, a relay of runners had carried a torch with the Olympic flame from Greece to Finland. No one new who the last runner would be, the one who would bring the torch into the stadium to light the Olympic flame for these Games. When the electric scoreboard flashed, "The Olympic torch will be brought into the stadium by Paavo Nurmi," the 70,000-person home crowd was stunned into silence. Then a huge roar filled the stadium and many Finns burst into tears. Nurmi worked hard all his life and never retired, although an attack of coronary thrombosis slowed him down in the late 1950s. In 1967, he experienced another attack. The following year, he used his hard-earned money to set up a foundation to study that disease, providing buildings for the researchers to do their work and a large sum of money. Nurmi died in Helsinki on October 2, 1973. On October 11, he was given a state funeral with full honors and was buried in his hometown of Turku. Since his death, statues of him have been erected all over Finland and at the International Olympic Committee headquarters in Switzerland. Medals and stamps have been issued in his honor and an asteroid was named after him. In 1987, Finland issued a ten-mark note with Nurmi on one side and the Olympic stadium on the other, making Nurmi the only Olympic athlete ever to be pictured on any nation's currency. Three gold medals, one silver medal, Olympic Games, 1920; Five gold medals, Olympic Games, 1924; One gold medal, two silver medals, Olympic Games, 1928.